This interesting surname is English but arguably or Norman French origins. Introduced into the British Isles at the famous Conquest of 1066 as Hildebert and Hilbert, it was an adaption of the pre 6th century Germanic given name Hildeberht, meaning "battle-famous". It is said to have been first recorded in England in its Latinized forms of Ylebertus of Lincolnshire, in the pipe rolls of that county in 1150, and as Hildebertus, again in Lincolnshire, in 1160, whilst Ilbert de Betelintun was recorded in the Curia Regis rolls of the county of Berkshire in the year 1212. The name enjoyed considerable popularity in medieval England, and has generated a number of modern surnames. 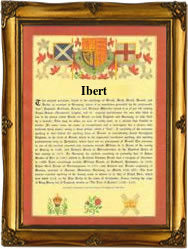 These include Ibert, Ilbert, Hilbert, Hibbert, Hibberd, Hibbard and others. Early examples of the surname recordings in the medieval charters include Margaret Hilbert of Suffolk in 1283, Roger Hileberd of Somerset in 1327, and John Heebarde of Suffolk in 1568. Amongst the recordings of the name in early surviving church registers is the christening of Robertus, the son of Anthonii Hibbert, on March 23rd 1576 at St. Peter's, Sheffield, in Yorkshire. An early coat of arms associated with the name has the blazon of a barry of eight in pale countercharged black and white. The crest is a hand holding a millrind. The first recorded spelling of the family name is shown to be that of Walter Ilberd also recorded as Walter Hilbert, and dated 1230, in the Pipe Rolls of Yorkshire, during the reign of Henry 111rd of England, 1216 - 1272. Surnames became necessary when governments introduced personal taxation. In England this was sometimes known as Poll Tax. Throughout the centuries, surnames in every country have continued to "develop" often leading to astonishing variants of the original spelling.